Oleg Vasiliev, the 1984 Olympic figure skating champion and 1988 Olympic silver medallist in pairs with Elena Valova, now coaches skating himself. 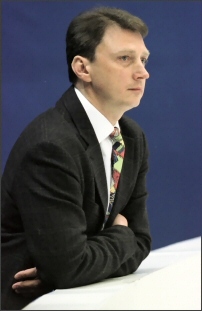 Oleg Vasiliev, the 1984 Olympic champion and 1988 Olympic silver medallist in pairs with Elena Valova, now coaches skating himself. His primary focus is the team of Tatiana Totmianina and Maxim Marinin, two-time Russian pairs champions and two-time World silver medallists. When he skated, Vasiliev trained with the dean of pairs coaches, Tamara Moskvina.